As the NBA wraps up its All Star festivities, something, or someone, was notably missing. 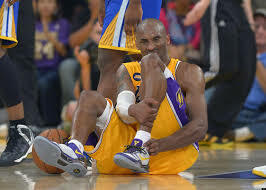 Kobe Bryant, who was voted a starter for the western conference, missed the game due to a knee injury. Bryant’s season has been met with constant adversity. When he finally came back from an ACL tear, Kobe played only six games before fracturing his knee. With his age, declining play, and injury problems, it may be time for Kobe to call it a career. Lets start with his age. At 35 years old, Kobe may not be able to keep up. Basketball is becoming more and more of a fast paced game. With teams like the Miami Heat, Golden State Warriors, and Los Angeles Clippers feasting off the fast break, the half court team is becoming less and less effective. The only team at the moment to be fully successful playing half court offense is the San Antonio Spurs. At 35 years old, Kobe may not be able to keep up. Bryant struggled mightily in transition in his six games back this year. If he gets back on the court, he may simply be outran. As far as Bryant’s individual play, a lot was left to be desired. In six games this season, Kobe averaged 14 points, 6 assists, and 4 rebounds per game. Those numbers are well under Kobe level but aren’t terrible. The real issue comes with the less noted stats. Bryant shot 42% from the field this season. That’s well under his career average of 46%. The real startling stat is his turnovers. Kobe averaged a staggering six turnovers a game in his six games this season. That is an unfathomably high number. In comparison his career high for a season is four turnovers. In addition, the NBA leader in turnovers per game this season is Stephen Curry with four. It is evident that his play is declining. Lastly, it may just not be worth it for Kobe to come back. The Los Angeles Lakers are one of the worst team in the NBA this season. At 18-35, the team just lacks talent. Nick Young, Pau Gasol, and an ancient Steve Nash are leading the charge in L.A.. Despite signing a contract extension, the Lakers are trying to bring in stars such as Carmelo Anthony or Lebron James this offseason. With past problems with other stars, it may be in the best interest of all sides for Kobe to call it a career. Due to all the reasons stated, it might be time for the Kobe Bryant era to end. If he does, it may do more harm than good. Derek Jeter knows when to call it quits; lets see if Kobe knows the same.